These American Honey Queens travel around the country building buzz about honeybees. Honey Queen Susannah Austin moves nuc boxes, or small honey bee colonies, to GloryBee customers looking to start their own hives for the season. / Coursety American Beekeeping Federation. As the spokeswomen for the American Beekeeping Federation, they’re tasked with building buzz about honeybees. It’s a sweet gig for the two women who are experienced beekeepers themselves. For nearly 60 years, women ages 18 to 25 have competed for the title of American Honey Queen and the opportunity to travel throughout the United States during their year long reign, giving talks and demonstrations everywhere from schools to state fairs. The Queens’ travel and expenses are paid for, but other than that the reward is promoting beekeeping nationwide. “Beekeeping isn’t something as visible as it ought to be,” Honey Queen Susannah Austin says, and that’s part of what inspired her to be a queen. The program “started as a mechanism to promote honey and to educate the public about the beekeeping industry,” says Anna Kettlewell (Honey Queen ’99), who today coordinates the Honey Queen and Princess’ busy travel schedules. Each year, the program selects two young female beekeepers (the Princess is the runner up) during an annual pageant of sorts for the agriculturally savvy. The first American Honey Queen – Kay Seidelman – was crowned in 1959, after the national association adopted a program that several states had run in the past. Today there are queens at the county, state and national level. Candidates must have first served as a state queen before competing at the national level. “The program basically has the same goals now as it did back in the ’50s,” Kettlewell says. And by today’s standards, some of the quirky-seeming rules governing Honey Queen conduct and comportment seem dated. “There are fairly strict guidelines you have to follow,” Austin says. Queens are required to wear the crown and sash at every event – hence keeping it on their person during travel. 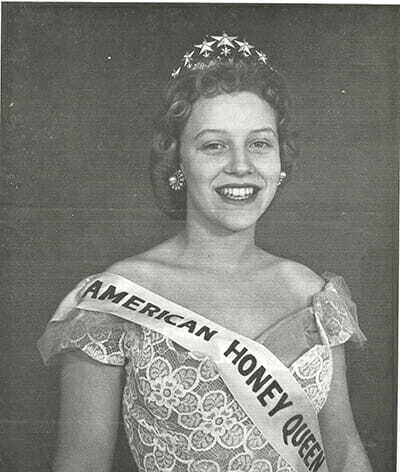 The first American Honey Queen, Kay Seidelman, was crowned in 1959. 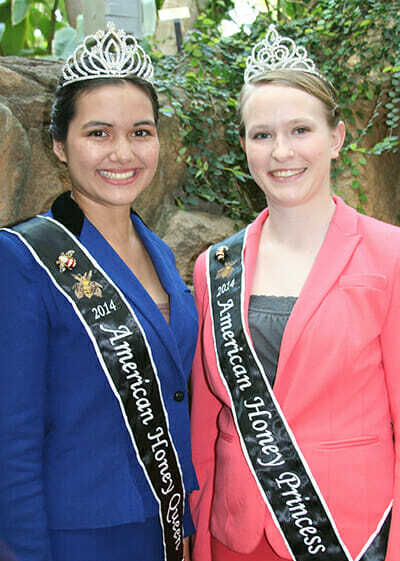 Today's American Honey Queen and Princess Elena Hoffman and Susannah Austin. While the core of basic bee biology and the properties of honey are the same, there’s always new research and products the young women must learn. In the 50s and 60s, beekeepers were primarily concerned with producing honey, and that’s how they made their living. Now, beekeepers are becoming more profitable through pollination programs, and in recent years, colony collapse disorder is the biggest issue facing beekeepers. “Frankly, I think the Queen and Princess have to learn a lot more than in previous years because there have been so many changes,” says Kettlewell, who comes from a family of beekeepers and also helps manage Badger State Apiaries, her family’s 100-hive operation in southeastern Wisconsin. “Honey producers, beekeepers, are a niche agricultural industry, so anything we can do to promote awareness and promote consumption of our product, we try to find a way to do that,” she says. Growing up in Millmont, Pennsylvania, Elena Hoffman’s favorite time of year was fall, when her family would extract fresh honey from their hives. She’s been abuzz about bees ever since. “They’re amazing little insects and extremely intelligent, which most people don’t realize,” she says. People think of two things when it comes to bees, she says. Honey and stinging. During visits to FFA groups and classrooms, the queens often bring a demonstration hive borrowed from a local beekeeper. And to convince audiences of the docile nature of honeybees, they’ll sometimes demonstrate a bee beard: allowing thousands of the insects to crawl on their neck and face while they discuss the hive. “I think having the young spokesperson helps break down the barriers and the fear that would come in starting this as either a hobby or as a profession,” says Kettlewell. 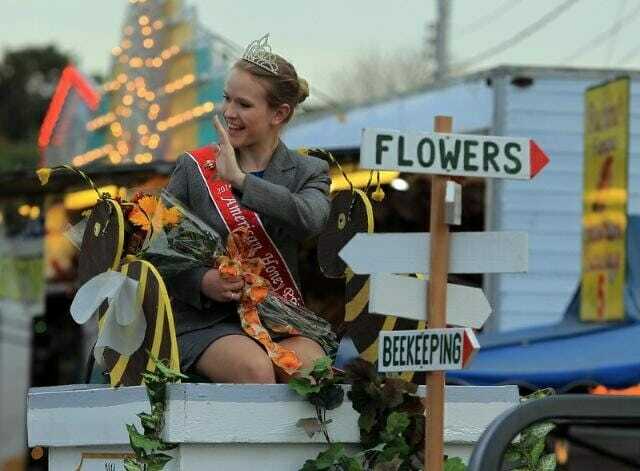 Hoffman, the 2014 Honey Princess, is a sophomore biology major at West Chester University in Pennsylvania. But the queen schedule is demanding, often requiring the young women take summer or online classes and the fall semester off. At each destination, the Queen and Princess stay with a host family, many of whom are fellow beekeepers. In her travels, Austin, 20, has found that people are nostalgic about farming, but often fail to see why it’s relevant to their lives today. She grew up in Orlando, where her family had a garden and a hobby farm with chickens. Like many young beekeepers, she was introduced to the hobby though her local 4-H club. She was around six when her family got their first hives. “I like the idea of going to talk to people about the farming that’s going on now and also about the people who are doing it,” she says. The evaluation process is intense and includes submitting writing samples, an oral presentation, an interview – and covert observation by honey spies. Three judges – generally ABF members who have different backgrounds in the industry – anonymously observe the girls at the convention, revealing their identities only several days later during the interviews. 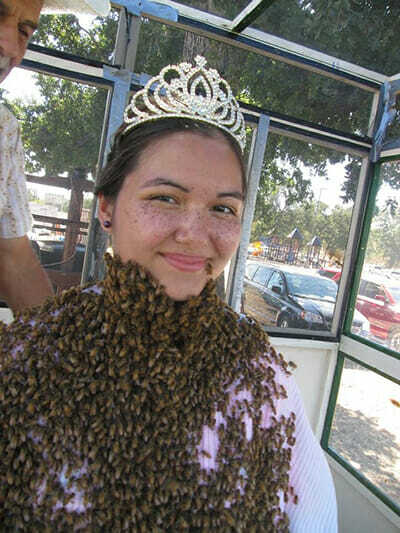 Austin sometimes demonstrates a bee beard, allowing thousands of the insects to crawl on her neck and face, to convince audiences of the docile nature of honeybees. Hoffman rides a float at the Topsfield Fair in Topsfield, MA. It’s a nerve-wracking process, says Hoffman. “You never knew when the judge might be around,” she says. But after the first day of the convention that anxiety faded and she was able to relax more. The number of applicants changes from year to year. Sometimes there are just a few, others upwards of ten, depending on how many states have active programs. There were more candidates in the 1950s through the ’80s, says Kettlewell. That can be attributed to a variety of industry factors including the number of beekeepers, the price of honey and challenges facing the industry. The demand for queen appearances is increasing, though, according to Kettlewell. The program aims to send the queen and princess collectively to a total of 30 states each year. “A lot of people get the wrong idea when they see the sash and the crown, but honestly, it is a really great opportunity to improve your media skills and just how you communicate,” Hoffman says. Both Hoffman and Austin estimate they’ve reached over 30,000 individuals so far this year.